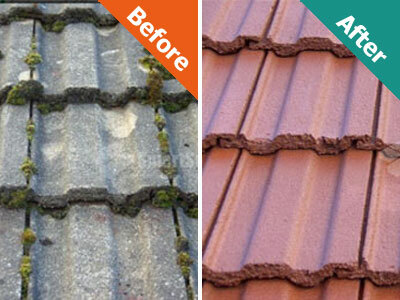 Restoring your roof through cleaning, repair and protection will transform the look of your property, improve durability and ultimately add value to your property. 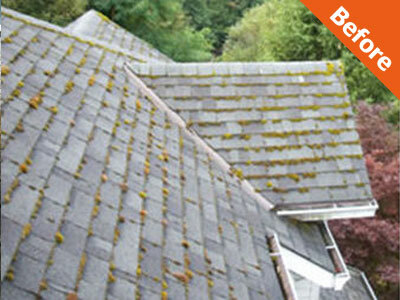 Under many moss-covered roofs are tiles and a structure that is perfectly sound – cleaning reveals this and provides an opportunity to improve the longevity of the roof. I NEED… SOLUTIONS WHAT NOW? 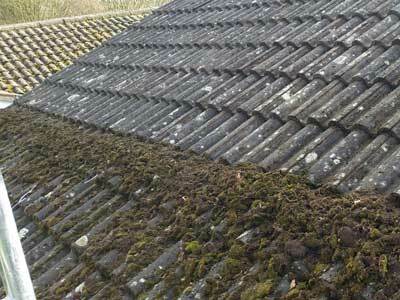 Moss Removal Dry scrape / Blackwash treatment Call us for help or to arrange a free site survey. Algae/dirt/fungi Removal Soft wash / low pressure cleaning Call us for help or to arrange a free site survey. Clean and protect Soft wash, low pressure rinse and biocidal protection Call us for help or to arrange a free site survey. 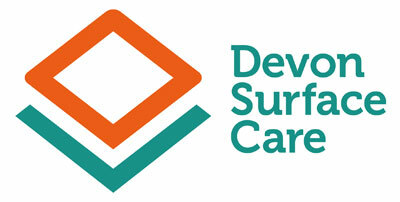 “Very, very satisfied with service from start to finish. No fuss, just got on with job in a professional manner. 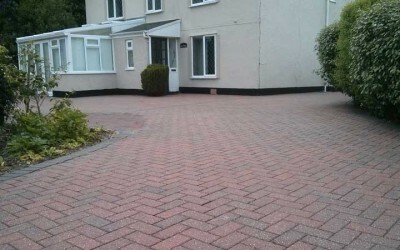 Satisfied with the sealing work carried out on over 350 sq. 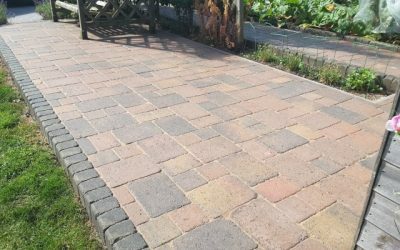 mtrs of concrete and kiln dried brick paviours. It was carried out exactly as per the quotation. 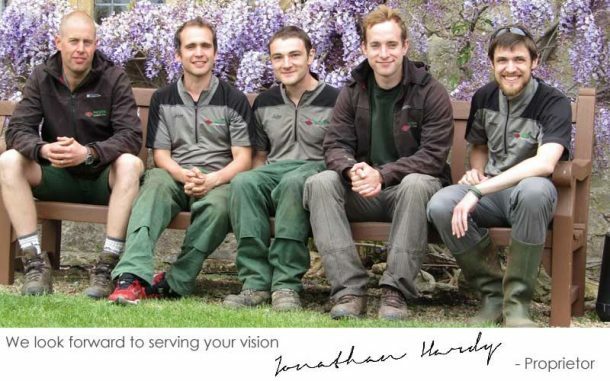 Get in touch for friendly advice or to arrange a site visit. SAFETY – the type of roof / gradient determines our choice of safe access which can incorporate roof ladders and a variety of powered access options. We are registered iPAF users. 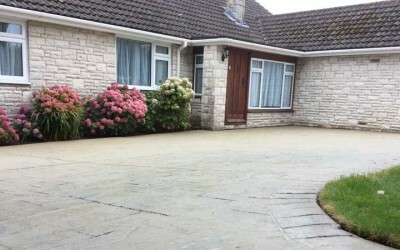 SURFACE TYPE – depending on the roof type (concrete, slate, tin, stone) we select the most effective cleaning system which can incorporate: dry scrape, pressure clean, soft wash – chemical clean. 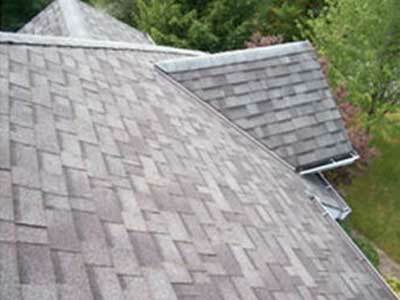 In most cases we would suggest that after a roof has been dry scraped or soft washed that it is protected. The protection we use is a biocidal treatment which impregnates the substrate of the tile (in the case of concrete, slate or fibre cement) and kills organic growth at a microbiological level. This means that the fungi, lichen or moss spores and root system is killed in the way it can never be with water (even at high pressure). Biocidal Wash is an approved and regulated product which stays alive within the surface for several months after application and continues to kill new organic growth which lands on the tile. Using our Clean and Protect system will change the appearance of your roof immediately but will also guarantee ongoing results. 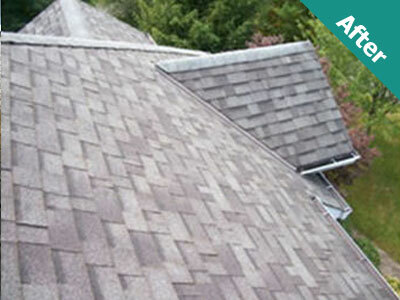 We would expect the roof to continue getting cleaner for up to six months after treatment. You can read more about the principles of soft washing here.